Brooke Rouse, St. Lawrence County Executive Director set up the exhibit Friday, with updated panels of the new County destination brand. 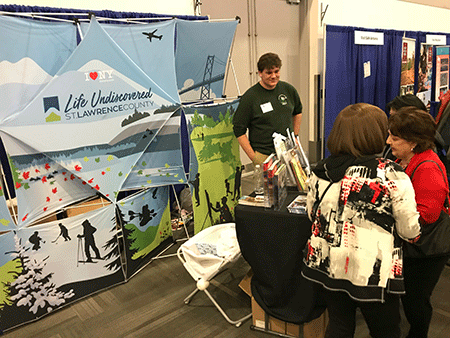 OTTAWA -- The St. Lawrence County Chamber, as the region’s Tourism Promotion Agent, recently attended the Ottawa Travel and Vacation Show March 17 and 18. The chamber has attended the show for many years, which is held annually at the Shaw Centre in downtown Ottawa. The event attracts more than 17,000 people. An hour from the border of St. Lawrence County, with a population of 1.25 million, Ottawa is an important market for tourism partners, said a chamber press release. "Although we are always working to increase overnight stays, we recognize the importance of the Ottawa market being very familiar with what we have to offer, for day trips, overnight getaways, or family adventures" noted Brooke Rouse, St. Lawrence County Chamber of Commerce Executive Director. "The show is not only a great opportunity to share information about the County, but to also get a better understanding of what people are interested in, and why they are currently coming to the County. It's market research for us too." This year, partners from the Frederic Remington Art Museum in Ogdensburg and the Nicandri Nature Center in Massena attended. The Ogdensburg International Airport also had representation throughout the entire show. "We reserve a double booth and have an attractive display that encompasses the entire County. We invite partners to come up to speak with attendees and share promotional materials. There is a constant flow of people, and the more we can engage them, the more value we get out of the show" said Rouse. "More people were aware of the Ogdensburg Airport this year. They were very interested in the new low cost direct flights. The representatives from the airport were swarmed with crowds the entire weekend, which is great for our County. If we can get them here to fly, they will likely shop, gas up and spend a night to catch an early flight. The airport has done a great job of exhibiting visitor information and attractions too. In time they will learn more about what is here". 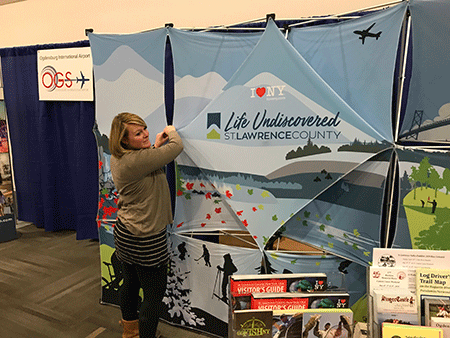 The St. Lawrence County Chamber of Commerce is the designated tourism promotion agent for the County, working in partnership with Empire State Development's I LOVE New York tourism marketing campaigns. More information can be found on the tourism site, www.VisitSTLC.com. Thomas Boudreau, Naturalist at the Nicandri Nature Center in Massena delighted families with stickers and temporary tattoos. The new center was exciting news to families looking for opportunities to entertain their kids, not far from Ottawa. 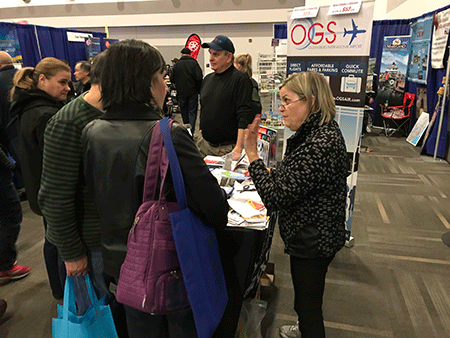 Rayanne McGee and OBPA Board Chairman Sam Lamacchia answered a flurry of questions about the expanded Ogdensburg International Airport throughout the two day show.